Newborn Swedish duo Gravkvade wanted to depict despair on their debut Grav|aska and they certainly succeeded. All of their previous demos, current album, and even the moniker itself contain the world “grav” = “grave” in it, so you catch the drift. On some recently watched TV show about Sweden, the subject of the tales written by famous Swedish author Astrid Lindgren came up, and it kind of became apparent to me that even tales/stories written for kids by a Swedish person are about loneliness and soul searching. Without understanding a word of Gravkvade Swedish lyrics I have a feeling they are trying to delve into the same subject on Grav|aska. With that thought in mind, Gravkvade deliver misery and hopelessness in droves. The music, roughly, breaks into two conjoined parts. Thick fabric of insanely diffuse guitars represent fast blackened element, while deliberate slower beat is more characteristic of doom metal. 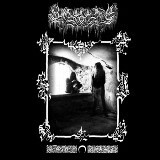 The definition of blackened doom emerges, however, depressive black metal tag can apply to Gravkvade as well. Together, these two parts create fixated religious experience on Dodspsalm. Vocals, at first being a background choir, complete the picture. Before too long, everything all of a sudden becomes frenetic, voice individualizes and crystallizes, before the composition washes out on some distant shore covered with sharp icy shards. On its longer tracks (Dodspsalm, Anderiket), Grav|aska thus swings from such rapid faster dementia to bottommost heaviness, which is no less maddening. If you think the album shorter tracks (Kottets plaga, Sorgeakt) will be the moments to relax and reflect, you would be dead wrong. It is true that Kottets plaga resorts to keyboards more than guitars, and it is playing one slow repeating religious melody. Repetitive in this case should not be taken lightly, as Kottets plaga is simply killing it with repetition. This is either ceremonial slow mass procession or individual walking up to Golgotha, but in either case it is exquisite torture, beginning and ending in the grotto with endlessly flowing water stream. Sorgeakt is slower, and more horrid, vocals totally reduced to desperate hysterical shrieks. Emptiness and suffering, similar to Swedish Silencer or Danish Nortt, is pervasive. Adding thundering double bass and moaning melody, Gravkvade portrays despair on a visceral level. At the same time instinctive and primitive Gravkvade is not an easy listen, and I doubt I will be coming back to it more often, but it achieves the goal it charted for itself, and that is commanding.